All transactions are safe and secure with a reliable history in online purchasing behind each of our associates. 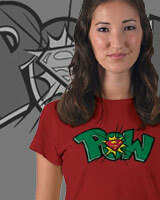 Buy the Superman POW t-shirts to own Superman clothing and merchandise. Pow! Whack! Bam! Boom! This tee features a vintage comic book style action word with the Superman logo positioned overtop. In comics it is popular to use big words to emphasize heightened action, especially during fights. These Superman Pow shirts probably won't give you a super punch or kick, but they will show everyone that you're always ready to jump into the action. The design is also available on men's apparel and kids' clothing. Give it as a gift with a Smallville t-shirt. In addition to the Superman POW tees above, browse the Superman Clothing Gallery for more apparel like men's and women's clothes, kids shirts or hoodies.